Join Us!!! We are looking for someone to help us cover Nicaraguan basketball. Please send us an e-mail. Defending champion Real Esteli (LSB) strengthened their roster with addition of 31-year old Puerto Rican international power forward Ricardo Sanchez (212-104kg-87, agency: BeoBasket). He joins another Puerto Rican player Jared Ruiz which is already in the roster. Sanchez played recently at Universo/Caixa/Brasilia in Brazilian league, but left the team earlier this month. In 13 games he recorded 7.7ppg, 3.5rpg, 2.0apg and 1.0spg this season. The last summer he played at Cariduros (BSN) in Puerto Rican league where in 28 games he averaged 9.0ppg, 5.8rpg and 2.1apg. Great season indeed as he was voted to Puerto Rican BSN All-Star Game. In 2005 Sanchez was drafted by Portland Trail Blazers (NBA) in second round (35 th overall). The list of the past achievements is quite long as among others his team made it to the Puerto Rican Manuel Zeno Gandia Cup final in 2015. Sanchez received also Latinbasket.com All-Puerto Rican BSN 2nd Team award back in 2011 and 2015. He has been also a member of Puerto Rican international program for some years. Sanchez has regularly played for Puerto Rican senior team since 2007 and previously for U21 National Team between 2004 and 2005. He also represented Puerto Rico at the Central American and Caribbean Games in Barranquilla (Colombia) last year. Sanchez's team won Gold and his stats at that event were 4 games: 4.5ppg, 3.0rpg. Sanchez is quite experienced player. Thanks to his pro career he managed to play on three different continents (Europe, Latin America and of course North America) in six different countries. Sanchez has played previously professionally in Argentina (Bahia Basket, Quilmes Mar del Plata, Libertad Sunchales and Regatas Corrientes), Mexico (Fuerza Regia), Panama (Caballos), Spain (La ICL Manresa), Venezuela and Puerto Rico (Manati, Capitanes, Brujos, Cangrejeros and Indios). The scouts decsribe him following way: Great talent and size. Sanchez needs to add toughness and versatility to his offensive game. Right now he is a great shooter, but doesn't score that much of the dribble. His ball handling skills are terrific, especially considering his size. Needs to gain some muscle and start getting dirty under the boards. 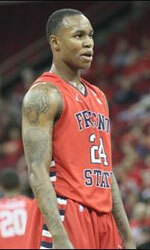 AD Isidro Metapan (Liga MB) signed 25-year old American point guard Isaiah Thomas (188-93). The last time (17) he played at Leones in Nicaraguan LSB league. Thomas' team made it to the LNB Semifinals in 2017. 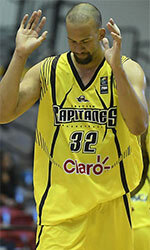 He has played previously professionally also in Colombia (Piratas).